I know this forum is for users who have moved on from Windows XP. But, I just thought someone might have a clue as to why I can't setup an account using OE6 with Windows XP. I know there are many frustrated folks who just one day discovered that their OE6 had stopped working using their Windows XP machine. I have a zoomtown email account that works just fine with the user name and password on Mozilla Thunderbird and zoomtown web mail. This means the problem I am having with OE6 is the program itself and not the account. When I start with a "new identity" to try and setup the account. I actually get the welcome mesage in the inbox from Microsoft, but I still can't send--I get the same error message. I read a funny story while I was trying to research my problem on the internet. There was a couple who used the same computer and the same OE6 program. They had seperate log ins on their computer, but their settings were identical except for their email user names and passwords. One day the man's OE6 email did not work, but his wife's was fine! Was it some other program the guy was using that his wife was not, or did Microsoft have something to do with it? Thanks for any ideas anyone might have. I am trying to get this computer working with OE6 and Windows XP for my brother. At one time he had a Road Runner account, and OE6 seemed to work fine with it. Then sometime in 2012 he changed to the Zoomtown ISP, and they have not been able to get OE6 working after that. Hello XP user!, yes this forum is for outlook express for newer windows (Windows 7, 8, 10 e.t.c) but of course we will try to help! About ISP, it is true that some isp's block port 25, but the error you are getting is invalis password so most likely it is not isp issue. May i ask, have you tried to use full email on username? (04-04-2016, 07:43 PM)Rafail Wrote: Hello XP user!, yes this forum is for outlook express for newer windows (Windows 7, 8, 10 e.t.c) but of course we will try to help! Is this of any help? Thanks. To be hones that does not help. but please check on your account settings if the "Account Name" field contains the full email. 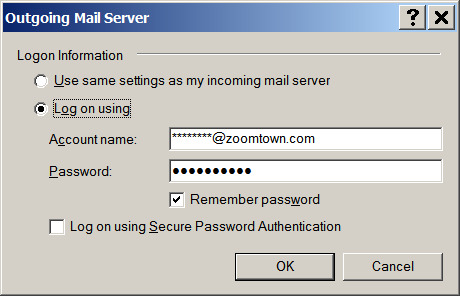 That field only had the user name, but I changed it to include the full email which is ********@zoomtown.com. It did not help. I also tried with secure authenication and without secure authenication required, and that didn't make any difference. Thanks. Wow! I don't know what happened, but all of the sudden when I opened OE6, it downloaded about 150 messages to the inbox that were dated 2/2015 to 4/2016. One was just sent a few minutes ago, and then all have the zoomtown domain address. So, I wonder if 50% of my problem is solved as I seem to be able to receive messages now. But, I still can't send. Let me try to change the port from 25 to either 465 or 587. Thanks. Still no joy on sending. I changed the outgoing port from 25 to 465 and then 587. Secure password authentication made no difference either. The error message is always the same. It says I can't login and the error code is always 0x800CCC79. There are sites on the internet that say this is due to a corrupted registry. This computer was not maintained for 8 years. When I ran SuperAntiSpyware the first time, it found about 10 trojans and other garbage that have since been deleted. Do you think this could be a registry problem or are the "registry fixers" just trying to sell me their software? Thanks. I just ran a free registry scanner that deleted about 5300 things. Didn't help as I still can't send emails. Thanks. Is there a way to uninstall OE6 and reinstall it? I have a OEM copy of Windows XP, but it is not for this computer. This computer is running XP media Center edition. Thanks. Please check if you have checked "My server requires authentication" as in picture below. OK Rafail, I think we got it. 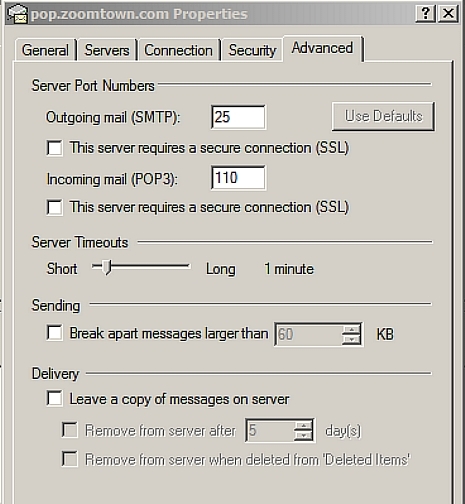 I'm not exactly sure what I did to get the receive part going, but OE6 is now sending and receiving emails. Let's see if it holds up. I hope it will. Later I am going to take screen shots of where all the dialog boxes should be set in case somebody has this problem in the future. I will post them in this thread--is that OK? Yes of course it is OK, I am happy that helped you.